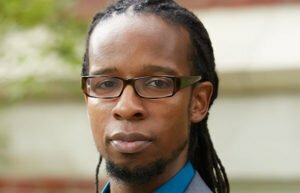 Ibram X. Kendi is Professor of History and International Relations and Founding Director of the Antiracist Research and Policy Center at American University. His second book, Stamped from the Beginning: The Definitive History of Racist Ideas in America, won the 2016 National Book Award (NBA) for Nonfiction. At 34 years old, Kendi was the youngest ever winner of the NBA for Nonfiction. He has published fourteen essays in books and academic journals, including The Journal of African American History, Journal of Social History, Journal of Black Studies, Journal of African American Studies, and The Sixties: A Journal of History, Politics and Culture. He has written for Diverse: Issues in Higher Education, The Root, Salon, The New York Times, New York Daily News, Time, Signature, The Huffington Post, The Washington Post, and The Chronicle of Higher Education. Kendi is the author of The Black Campus Movement, an award-winning book on Black student activism in the late ‘60s and early ‘70s, and is currently working on his next book, How To Be An Antiracist, to be published in 2019. Dr. Kendi’s appearance at the Fall Conference 2018 is made possible with support from the Vermont Community Foundation, the Fountain Fund of the Vermont Community Foundation, and Patricia Fontaine.